In the summer of 2002, Nintendo released Eternal Darkness: Sanity’s Requiem, its first M-rated title, and all across America controllers were angrily pitched across the room. It was a flashpoint of indignation. Imagine a young player, having patiently scraped together a small fortune in allowance, hurrying home one evening in late June with a copy of Eternal Darkness in hand, eager to enjoy a nerve-racking bout of horror. For a while all is well: The game is richly atmospheric and literate, bristling with old-fashioned gothic intrigue and fascinating mysteries coursing through its sprawling Rhode Island mansion. But then something strange happens. As the player sneaks through a canted-angle hallway, narrowly avoiding a booby trap of rotating blades, the GameCube suddenly warns that a controller has been unplugged. Then, the volume is inexplicably muted, and the TV turns off and on. Not wanting to take any chances, the player pauses the game and tries to save her progress. Instead, a warning message appears: “Are you sure you want to delete all saved games?” She selects “cancel.” The files are erased anyway. And then the game resets. You can see why a player might be upset. But this erratic behavior, incredibly, was not a glitch or a flaw—it was a feature. Patented by Nintendo and extolled as all but revolutionary by critics, the “Sanity Meter,” as developer Silicon Knights called their innovation, was a marvel of concentrated aggravation. The idea was simple: The meter, similar to your typical health bar, would track the mental constitution of the protagonist as she endured the game’s manifold terrors, reflecting, as the game progressed, the toll it was taking on her psyche and her perception of the world around her. Once depleted, the sanity meter would begin to introduce certain special effects into the environment, visual and aural manifestations of her encroaching madness. Most of these effects were benign: The walls of a room might look as if they were bleeding, for instance, or the eyes in a painting might follow you around as you move. But it soon transpires that distortions of the game world aren’t enough. At this point the sanity meter might, say, lower the volume on your television, or trick you into thinking a bug is crawling around the corner of your screen. At one point the game even seems to end, as a title card invites you to continue the adventure in a forthcoming (and entirely fictitious) sequel. The game-disrupting gimmicks yielded by the sanity meter owe much to the influence of 1998’s Metal Gear Solid, in which a character named Psycho Mantis takes advantage of the PlayStation controller’s tiny internal motor to make it seem as if he were moving the pad around telekinetically. But in fact the notion of interrupting a story for the sake of surprising or frightening an audience has a much older precedent. Imagine a young moviegoer, having scraped together money for a ticket in the summer of 1959, heading out to catch the premiere of The Tingler, a new horror film starring Vincent Price. For a while all is well: The film is ludicrous and campy, and the moviegoer is grinning widely as Price hams it up as a mad scientist. But then something strange happens. As the film reaches its climax, the deadly creature at the heart of the film, an oversized centipede called The Tingler, escapes into a crowded movie theater, where it threatens to zap a few patrons to death. The moviegoer sees the bug crawling across the screening in silhouette, as if it were draped across the projector, before it scurries back into the room. Price appears on screen and warns that, indeed, “the Tingler is loose in this theater!” He instructs the audience to scream—the only way to defeat the Tingler. Then the moviegoer feels it: An electrical buzzer beneath the seat has been triggered, giving him a literal shock. William Castle, director of The Tingler, spent a quarter of a million dollars installing these devices in theaters throughout the United States. It paid off, as like nearly all of Castle’s films, The Tingler was a modest financial success, owing largely to the (ahem) buzz around its bottom-shocking climax. An otherwise undistinguished director of low-budget, self-produced genre movies, Castle built a career around his work’s much-publicized sensationalism, drawing audiences who wanted to see not so much the films themselves as their singular embellishments. These were consistently ludicrous: A ticket to see his first feature, Macabre, included a $1,000 life-insurance policy protecting against death of fright in the theater; the climax of Homicidal, meanwhile, was interrupted by a 45-second “fright break,” during which patrons too terrified to continue watching could leave the theater and receive a refund. 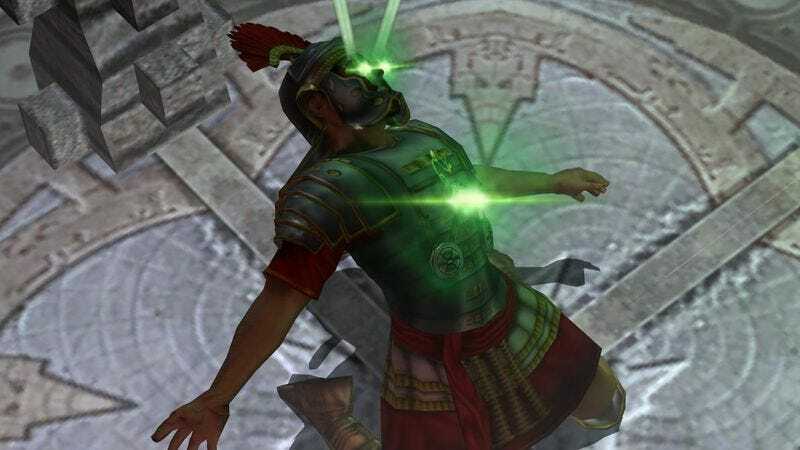 Eternal Darkness benefited from slightly more sophisticated tactics, but it isn’t difficult to imagine Castle himself devising and marketing Nintendo’s patented “sanity meter”—that epithet even sounds like a Castle original. And in the end the sanity meter’s appeal isn’t much different from the gimmicks promoted by films like The Tingler: Both promise audiences the novelty of an experience they’ve never had before. Perhaps that’s a superficial virtue, an easy way to render something ordinary extraordinary. But there’s value in seeing and feeling something new, something that genuinely takes us by surprise, even if the effect is chiefly to annoy. The purpose of spectacle is simply to astonish, to awe. The sanity meter accomplishes that. It’s hard to watch the game reset itself without feeling amazed that they’d have the gall. The word “gimmick” itself, of course, has chiefly negative connotations: We tend to think of gimmicks as fundamentally tawdry, nothing more than cheap selling points designed to dupe us into buying something. But William Castle understood that gimmickry could be a movie’s animating force—its main attraction, shallow but electrifying. We like to think of ourselves as discerning and intellectual consumers, but it’s important to remember that one of the main reasons to watch movies or play video games is for the charge of spectacle. Indeed, the cinema itself was regarded, upon its inception, as a kind of gimmick: a magic trick of light and shadow, impressive for its novelty. Audiences marveled at the moving image because they’d never seen it before: They’d never seen a train come alive and move toward them as if it were entering the room; they’d never seen a crowd scurrying out of factory doors without being there to see it. The cinema afforded people the pleasure of a very simple thing: an illusion of movement. In other words, a gimmick. Castle’s tricks were inspired in part by the 3-D boom in the early 1950s, which had emerged in order to draw audiences away from the allure of television by promising them a new kind of moviegoing experience. It occurred to Castle that people want to experience something unconventional and surprising, and he dedicated his career to devising methods by which to distinguish his otherwise rote horror pictures from the standard cinematic fare. You could say that in a sense the production of all video games proceeds from a similar desire to superficially stand apart. The essence of gaming, with its emphasis on improved graphics and unprecedented features, has always been rooted in spectacle. The meta-gaming gimmicks that distinguish Eternal Darkness are designed very much in the William Castle spirit: As with Castle’s theatrical novelties, the sanity meter and its effects represent an earnest effort to offer us an experience we’ve never enjoyed before. Eternal Darkness recognizes that what we want is the thrill of a genuine novelty. If this has stood the test of time, it’s not simply because of the elegance of its survival-horror craft or the impact of its story. It’s because it understands that we want something new and it indulges that desire grandly.